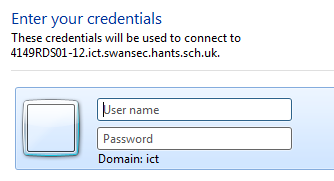 You can remotely access the school network from home. This will allow you to access your school documents and shared resources like the R drive. You can also copy and paste (drag not supported) files from your home computer to the College network and back again. Copy speeds may vary depending on your broadband connection. Supported platforms: Windows, Mac OS, iPad iOS, Windows tablet & Android tablets using the Chrome browser. Make sure the boxes are filled in correctly. You may need to change some information. If required you can now copy and paste (not drag) files from your home computer to your user area. If you have any problems accessing or using this please go to the IT Support office in W12.